A West coast favorite, its mild and sweet flavor, firm texture, unique and delicate, available all year round. For a quick and easy Friday night dinner try the delicate taste of Dover Sole fillets. Have a complete healthy meal in 20 minutes that your family will always enjoy. Dover Sole fillets are packaged in one-pound gold foil vacuum sealed packs to obtain freshness. Dover Sole is the perfect dish if you are preparing a romantic meal. Melt any man's heart with a quick and easy delectable meal that will take you less than an hour to prepare. Add a bottle of champagne and you have the perfect setting for the most perfect evening. Dover Sole will satisfy a quick healthy meal for your family or create a romantic little getaway without leaving the house for you and your significant other. Let us help you make life easier with our Dover Sole Fillets already cut to perfection and just waiting for you. 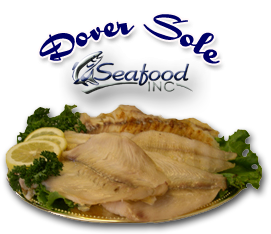 As a fresh dover sole supplier we ship fresh and frozen dover sole worldwide. Seafood Inc is dedicated to superior quality of its frozen and fresh dover sole.